For kids approximately 5-8 years old. 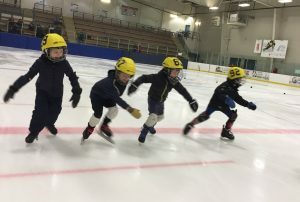 Starts, stops, basic position and technique are introduced by non-competitive games of sustained activity. Parents with helmets are welcome to skate. Registrations for Speed Skate 1 (SSI) are accepted for either Saturday or Sunday or both days. Coaches: Rebecca Mahler (Saturday) and Alexandre Larouche (Sunday) as well as helpers from the senior competitive group. *Safety glasses can be purchased at Overlander Sports in Yellowknife.